A post-apocalyptic drama, The Road is a grim examination of the human condition when survival is all that matters. The film is dour, grey, and frequently hypnotic. In the near future, an undefined disaster has effectively destroyed the planet and most of its inhabitants. 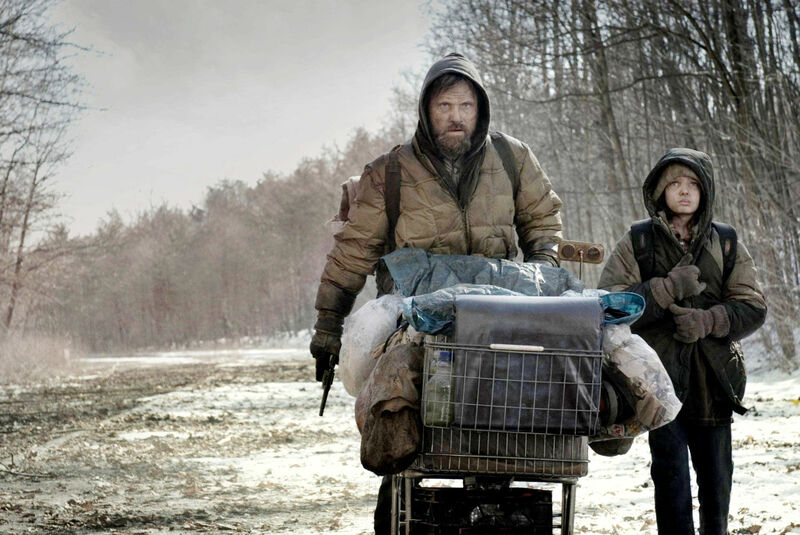 A Man (Viggo Mortensen) and his Boy (Kodi Smit-McPhee) have survived for years, travelling along a road, heading south towards the coast line where there is a vague promise of better conditions. The Boy was born soon after the world-ending cataclysm, and his Mother (Charlize Theron) is seen only in flashback. The family had survived for a few years in their home, but with food running out, she gradually gave up hope. Now on the road, the Man is armed with a pistol but only two bullets, and has to fend off armed marauders and other survivors, some of whom have resorted to cannibalism. Nature continues the process of destroying itself, with entire forests self-combusting, adding to the grim, burnt-out, ash-laden terrain. Life is a daily struggle for food and shelter, and the man's singular obsession is protecting the boy from capture by bad people, at any cost. An adaptation of the Cormac McCarthy novel and directed by John Hillcoat, The Road is a meandering pathway through pessimism. With an episodic structure and limited reasons to celebrate anyone or anything, this is not an easy film to take. Rather, Hillcoat presents a hellish vision of the worst that can happen, a planet destroyed, humans reduced to bedraggled travelers turning on each other, and men and woman embracing their most base instincts to find food, shelter, and kill whatever needs to be killed to remain alive for one more day. With all vestiges of civilization destroyed, there is little that separates men and women from animals. The stunning cinematography by Javier Aguirresarobe paints the screen grey and black, nature's dance of death reflected in the gloomy souls of the few remaining survivors. And unlike other cinematic representations of a post-apocalyptic future, The Road is a film devoid of heroes. There is no Mad Max and no John Connor providing hope for a better tomorrow. The Man is tired, flawed, obsessed, and beginning to lose perspective on the difference between good and evil. Hillcoat and screenwriter Joe Penhall chart his gradual descent into moral murkiness, as the need to protect the Boy brings the Man dangerously close to the same behaviours he is supposed to be guarding against. The pervasive sense of despair is highlighted with a series of questionable choices. The Boy is frequently left puzzled by the actions of his father, and he is right to be. The Man has many answers, but the years of traveling on the road are clearly taking their toll. He decides to leave a shelter that appears to be safe, and his treatment of an old man (Robert Duvall) and a thief (Michael Kenneth Williams) present a less than ideal role model for the Boy to grapple with. Despite being an unrelentingly bleak film, The Road can also metaphorically represent life, with a sometimes inexplicable urge to continue down the path despite not knowing what lies ahead, and consequences to both stopping on the road and stepping off it. The one sure thing the Boy will learn is that the only thing he can control is the legacy he leaves for others to remember.